Unless noted below, LitMingles do not meet in August and may not meet in December. Meeting dates listed are subject to change. Check the LitMingle Calendar for exact dates and topics of upcoming meetings. Got Questions? Contact the MINGLE-MEISTER Jennifer S. Pitts. 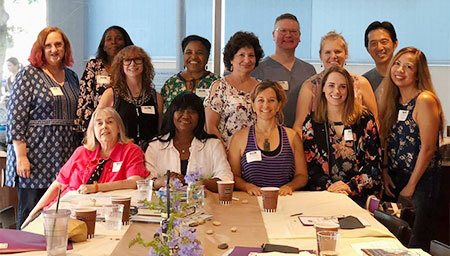 Taken at the annual Coordinators’ brunch, August 2018. Usually meets the second Wednesday of each month except July and December from 7:00 PM to 8:00 PM at Panera Bread. Usually meets the second Thursday of each month from 6:30 PM to 8:00 PM at the Once Upon a Time Bookstore. Free parking is available in the large lot behind the shops. Access it via the small alley next to Black Cow Cafe. Usually meets the fourth Monday of each month except July and August from 6:30 PM to 8:00 PM in the Meeting Room of the Los Angeles Public Library – Sherman Oaks. Usually meets on a Saturday of each month except August from 10:15 AM to 12:00 NOON at the Sierra Madre Episcopal Church of the Ascension Church parish hall meeting room. Members should follow our SCBWI signs and we’ll be outside to help everyone find their way prior to start of meeting. Usually meets the first Wednesday of each month except July and August from 6:15 PM to 7:45 PM at the Westchester-Loyola Village Branch Library. The Westchester-Loyola Village Branch Library has ample free parking in the back and on the street in front. It is also within two blocks of the Santa Monica and Los Angeles Metro bus lines. Bottled water and snacks are provided. Usually meets the third Monday of each month except July, August and December from 7:00 PM to 9:00 PM. Usually meets the first Wednesday of each month except July and August from 7:00 PM to 8:45 PM at the Ocean Park Branch Library. Check the LitMingle Calendar for exact dates and topics of upcoming meetings.